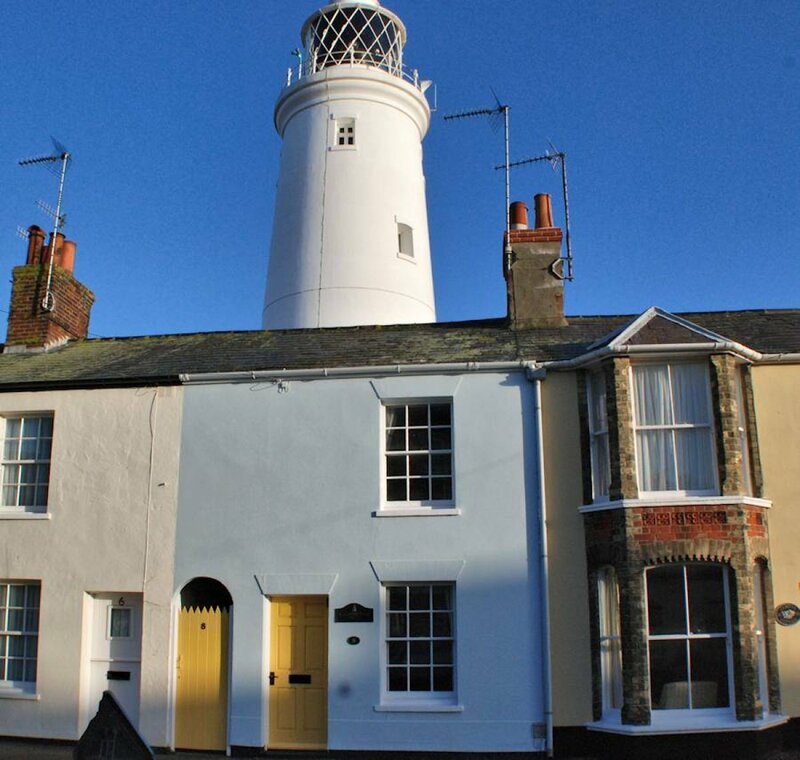 Lighthouse View in Southwold is a comfortable and welcoming holiday cottage sleeping four people in two bedrooms. Lighthouse View in Southwold is a comfortable and welcoming holiday cottage sleeping four people in two bedrooms. This early-Victorian cottage is by St.James' Green in the very heart of this attractive coastal town. From the front door it is just yards to the promenade and sea. Not only does Lighthouse View offer an excellent holiday location but Southwold's landmark lighthouse stands just over the wall of the cottage's rear courtyard. The fully-operational lighthouse is accessed from nearby Stradbroke Road and is open on certain dates for visitors to climb up to the top to enjoy the wonderful views. Children (and perhaps adults) will be captivated by the gentle rotation of the lights from the lighthouse in the evening. Car parking is freely available in the immediate area. Indeed you may park your car on arrival and not use it again throughout your stay. Owners Russ and Sue are happy to share their delightful cottage with holidaymakers who would love to experience this wonderful location in the charming town of Southwold. Children over 4 years are welcome as is one well-behaved dog. 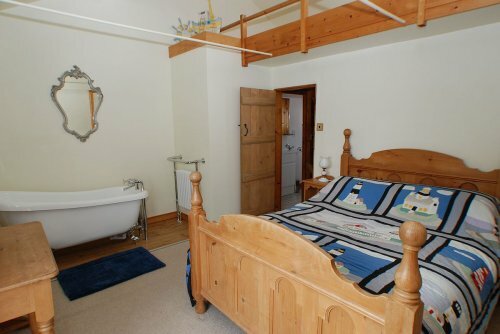 For the young and the young at heart this super seaside cottage has so much to offer. Courtyard: A useful area with high walls which wraps around the rear of the cottage. Wonderful view of lighthouse proudly towering above. This features a table and four chairs. Secure gate to side passage. The Courtyard could be handy for bicycle storage and also for those sandy buckets and spades, ready for the next visit to the beach. Carpetted cottage stairs lead up from the Dining Room to a landing off which are the three upstairs rooms. Front Double Bedroom: Carpetted with king-size bed, vi-sprung mattress, feature bath, skylight with a view of the lighthouse (with electric blind) and fireplace (not in use) and high ceiling. Benefits from the morning sunshine. Built-in wardrobe with chest of drawers plus additional bedroom furniture, long mirror and flatscreen TV. Two bedside tables with lamps. 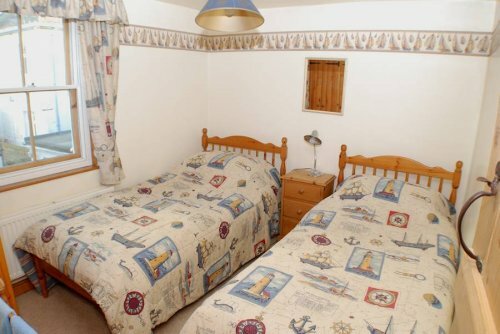 Rear Twin Bedroom: Carpetted and with window overlooking courtyard and lighthouse. Twin beds with central table and lamp. Built-in storage. Mirror. 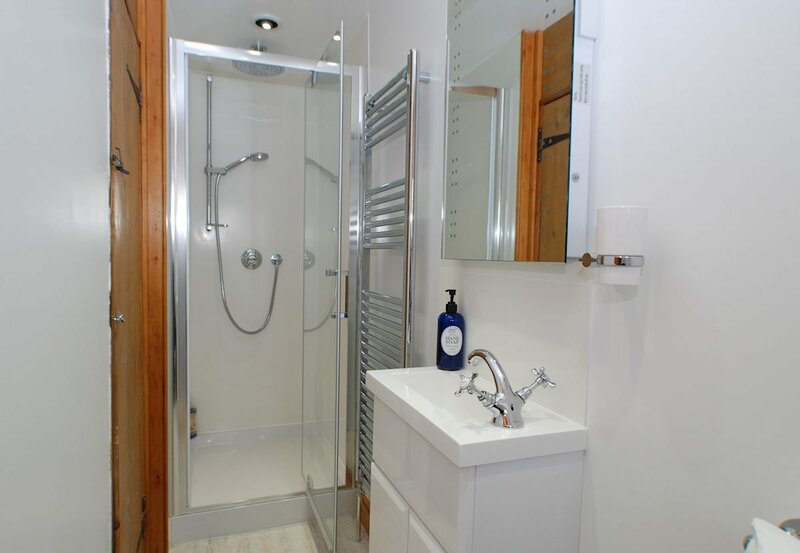 Bathroom: A new contemporay bathroom with two shower heads, wc, washbasin with mirror over plus shaverpoint. Window to rear with a view of the lighthouse. Open all year. Weekly bookings are Saturday 3pm - Saturday 10am. Short Breaks, three nights minimum out of season at a starting cost of £240. For short break prices please contact Russ & Sue direct. One well-behaved dog welcome, at additional charge. Not to be allowed on furniture or upstairs, nor left at the property alone. Children aged over 4 years welcome. Tariff includes linen, but please bring own beach towels. Gas central heating. Gas hob and electric oven. All heat and power included. Car parking is freely available in the immediate area on a first-come first-served basis. Please note that due to cottage stairs Lighthouse View is unsuitable for those with limited mobility. All short breaks are for a minimum stay of 3 nights. All linen is included together with unlimited wi-fi. Please note that there is an additional charge if bringing your pooch of £25 per week. 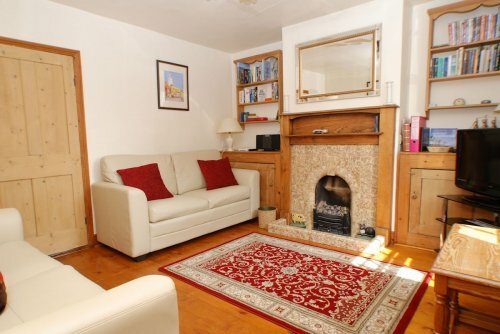 Lighthouse View Cottage is centrally situated amid many of Southwolds attractions. Just a stroll to the beach, pier, museum, High Street, St.Edmund's Hall (for Summer Theatre and events), brewery and, of course, the Lighthouse! The Lounge at Lighthouse View Cottage, where the sea is just minutes from the front door. 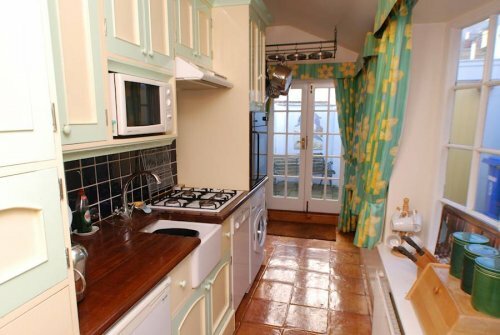 The Kitchen leads to French doors which open onto the courtyard, with Southwold Lighthouse just yards away. The Twin Bedroom at Lighthouse View overlooks the courtyard and the Lighthouse. The patio area is directly beside the foot of the lighthouse. Designed and supported by Blythweb Ltd 2015.